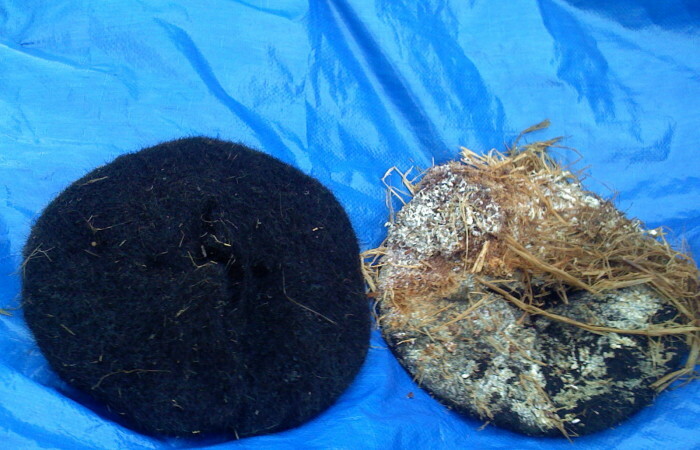 Hair mats used in oil spill cleanup, like all traditional cleanup materials are incinerated or landfilled by hazmat teams. In 2002, Matter of Trust and Fungi.com joined forces to do lab research on—if fungus could breakdown mats made from human hair soaked in toxic oil. The goal was to remediate the oil spill waste and create landscape-grade compost. In 2007, we decided to test this in the field when an oil spill occurred in SF Bay. The Cosco Busan container ship hit the Bay Bridge and spilled 53,569 gallons (202,780 liters ) of bunker fuel which came ashore within hours onto Ocean Beach. Conclusion: This is a labor of love. In the Amazon where there are people living with oil pits that resulted from pipeline leak, debris was left there for decades. We believe this is a worthwhile and empowering solution. For shoreline cities with little landfill space or time, this is impractical and hazardous waste is better incinerated for energy in a closed system that takes care of particulates.